I think I had the best job of the week because I got to tell the stories of the volunteers, who were amazing. I heard about lasting friendships, feeling good about helping others, travels to far off places, skills learned and years given to HFH. It was truly heart-warming. I wish this feeling I have now could last forever. If you’ve never volunteered to help others, I highly recommend you look into it. And after you do it, you’ll know that as much as you put into it, you’ll get far more in return. Many of felt a little selfish becuase we felt so good! One thing to remember though…when the event fades away, and you stop feeling that ‘high’ go do it again, and again, and again…so you can always feel this good and spread those good feelings throughout your life. If you’re interested, the next JCWP is in May in the Gulf. They need us…will you be there? 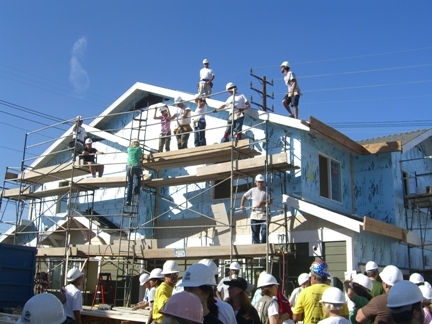 This entry was posted in Entrepreneurship, Mentoring, Public Relations, Small Business and tagged affordable housing, gulf, habitat for humanity, homes, jimmy carter work project, katrina, port of los angeles. Bookmark the permalink.